The article studies the evolution of the concept of corporate social responsibility and its application in public-private partnership programs. Corporate social responsibility has gone through several stages of reinterpretation in management. Though today an obsolete approach to this concept of corporate social responsibility as an instrument of charity still prevails in Russia. We think that transition to a concept of mutually beneficial cooperation between private companies and the public sector is crucial today. Such cooperation is called social public-private partnership (SPPP). One of the common problems of social projects is a lack of private donations within the framework of CSR. At the same time CSR is a necessary condition for international listing of the organization. This problem can be solved through consideration of public-private partnership as a model of interaction between the state and business in activities within CSR. Patrunina K.A. (2017). Corporate Social Responsibility in the implementation of Public-Private Partnership projects [Korporativnaya sotsialnaya otvetstvennosty v realizatsii proektov gosudarstvenno-chastnogo partnerstva]. Public-Private Partnership, 4(3). (in Russian). – doi: 10.18334/ppp.4.3.38448. Barnea A., Rubin A. (2010). 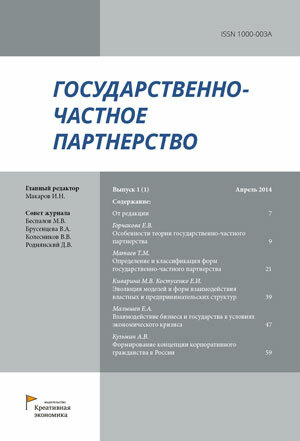 Corporate social responsibility as a conflict between shareholders Journal of Business Ethics. (97). 71-86. Brinkerho J.M. (2002). Government-nonprofit partnership: A defining framework Public Administration and Development. (22). 19-30. Donham W. (1927). The social significance of business Harvard Business Review. (4). 406-419. Friedman M. (1970). He Social Responsibility of Business is to Increase its Profits The New York times magazine. Fry L.W., Keim G.D., Meiners R.E. (1982). Corporate Contributions: Altruistic or for Profit? Jamali D., Keshishian T. (2009). Uneasy alliances: Lessons learned from partnerships between businesses and NGOs in the context of CSR Journal of Business Ethics. (84(2)). 277-295. Porter M.E., Kramer M.R. (2002). The Competitive Advantage of Corporate Philanthropy Harvard Business Review. Woolcock M., Narayan D. (2000). Social capital: Implications for development theory, research, and policy World Bank Research Observer. (15(2)). 225-249.